You are being watched! 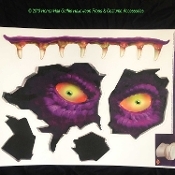 This toilet tank cling will terrify guests as a purple beast with yellow eyes appears to be peering through the toilet tank. An additional cling appears to be his claws coming through! Adheres to most smooth surfaces and will fit most toilets.